8 The LORD said to Moses and Aaron, 9 “When Pharaoh says to you, ‘Perform a wonder,’ then you shall say to Aaron, ‘Take your staff and throw it down before Pharaoh, and it will become a snake. '” 10 So Moses and Aaron went to Pharaoh and did as the LORD had commanded; Aaron threw down his staff before Pharaoh and his officials, and it became a snake. 11 Then Pharaoh summoned the wise men and the sorcerers; and they also, the magicians of Egypt, did the same by their secret arts. 12 Each one threw down his staff, and they became snakes; but Aaron’s staff swallowed up theirs. 13 Still Pharaoh’s heart was hardened, and he would not listen to them, as the LORD had said. The liberation of the people of Israel from their servitude to the Egyptians in not just a conflict between peoples, at its root it is a conflict between the LORD the God of Israel and the Egyptian gods. Moses becomes the vessel of the LORD’s work against the Egyptians and Pharaoh and the ‘wise men, the sorcerers and the magicians of Egypt’ line up on the other side. The central two characters, Moses and Pharaoh, both become representative or avatars of the divine power behind them. Moses here will be ‘like a God to Pharaoh, and your brother Aaron shall be your prophet.’ Pharaoh derives his authority from a divine claim that the Pharaoh is a ‘son of Ra’ the chief god of the Egyptian pantheon. Two conflicting views of creation (Ra is the chief god of not only the sun but creation for Egypt) and two conflicting views of the way that world should be structured are in play. Within Egypt, the superpower of that era, Pharaoh is all powerful and yet in this narrative Pharaoh plays a tragic character. Pharaoh will not listen to Aaron and Moses initially, but the conflict between competing sources of divine power will be seen not only by the individual players but also by both peoples (the Egyptians and the Hebrews). The end is that even the Egyptians will ‘know that I am the LORD,’ as the coming ecological disasters will testify to the power of the LORD over creation and the inability of Ra and those loyal to him to prevent this upheaval. One of the places where translations don’t quite do justice to the original language is here with the language about the snakes that come from Aaron’s and what comes out of the Egyptians staffs. The word here in Hebrew is Tannin which is not the typical word for snake but rather for the serpent like chaos monster or dragon. Both sets of Tannin, from Aaron’s staff and the Egyptian magicians, are forces of war and destruction and chaos. Here chaos is unleashed symbolically in a struggle between the LORD of Israel and the lords of Egypt. 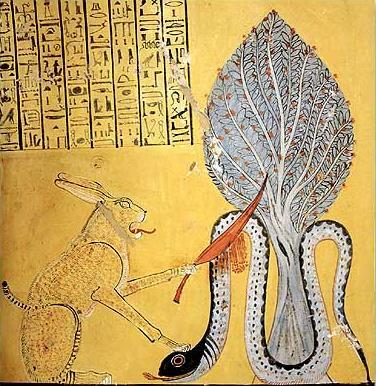 Interestingly, to me at least, in Egyptian mythology the nightly struggle of Ra is against Apep (or Apophis) the snake like force of evil and chaos but now in matching the display of power by the LORD unleashing the forces of chaos even the emissaries of Pharaoh, son of Ra, must unleash their own forces of chaos. Ultimately it is the tannin released by Aaron which swallows the tannin released by the wise men of Egypt and this initial conflict foreshadows the chaos unleashed on creation that is to come. One of the things that begins here is the inability of the Egyptian wise men, sorcerers and magicians to undo what has been unleashed through Moses and Aaron. They may initially replicate what Moses and Aaron do but they cannot undo it. They can only add to the chaos which threatens to consume all of Egypt. Perhaps Pharaoh is merely trapped within a worldview that cannot imagine letting the Hebrew slaves go. Perhaps Pharaoh’s heart and mind receive some divine nudge to harden his resolve and will as the chaos unfolds around him and his people. Perhaps Pharaoh, who views himself as the king on the chess board is merely a pawn being played. Regardless Pharaoh, the son of Ra, will be unable to avoid being swallowed up by the chaos unleashed as he struggles against the LORD. The gauntlet has been thrown, the challenge has begun for the lives of both peoples. Warnings are unheeded, hearts are hardened and next the heart of Egypt will bleed. 20 Moses and Aaron did just as the LORD commanded. In the sight of Pharaoh and of his officials he lifted up the staff and struck the water in the river, and all the water in the river was turned into blood, 21 and the fish in the river died. The river stank so that the Egyptians could not drink its water, and there was blood throughout the whole land of Egypt. 22 But the magicians of Egypt did the same by their secret arts; so Pharaoh’s heart remained hardened, and he would not listen to them; as the LORD had said. 23 Pharaoh turned and went into his house, and he did not take even this to heart. 24 And all the Egyptians had to dig along the Nile for water to drink, for they could not drink the water of the river. 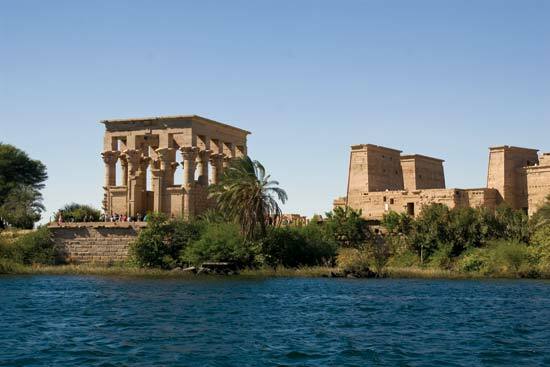 The Nile River, or to the ancient Egyptians simply the river, is the heart of the Egyptian empire. Egypt was shielded from other early civilizations by deserts on both sides and the Nile river delta provided for an agricultural abundance that allowed the people to focus on the construction of large public projects like the pyramids. The river is a source of food, transportation, and ultimately life. Without the Nile River, there is no Egyptian empire and even though the Nile never becomes a significant source of worship for the Egyptians, it is simply an assumed part of life. Yet, it is here that the LORD instructs Moses and Aaron to strike first. The heart of the Egyptian empire bleeds, life begins to end and an ecological disaster begins to unfold. This begins a highly-structured telling of the signs and wonders that bring the people out of Egypt. In the three sets of three where the first in each set Moses speaks to Pharaoh outside in the morning, the second Moses speaks to Pharaoh inside in the palace and the third comes abruptly without a warning. Some would argue ecologically that one plague would naturally follow the others because of the ecological devastation, and while that may be true the narrative moves where the LORD is in control of each sign and wonder unfolding. In Genesis 3, the end of the story of Adam and Eve, the disobedience by Adam and Eve which is supposed to result in their own deaths is ultimately born by the earth (see Genesis 3: 17). Here also it is the earth which bears the consequences of the disobedience of Pharaoh. Of the first nine signs, only the hail is fatal to humans and even then, Pharaoh and his people are warned to bring their people and animals into a secure place with a twenty-four-hour warning. Each sign seems designed to make the Egyptians aware that it is the LORD who is the God who has power over the creation and here the waters of Egypt are the first to bear the consequence of the refusal of Pharaoh to let the people go to worship the LORD. Again, the magicians of Egypt, by their secret arts, are able to replicate this chaos with some of the uncontaminated water and yet they are unable to reverse or limit the effects. They can only contribute to the chaos. The river turns to blood, the fish die and the waters stink and are unable to drink. The lifeblood of Egypt is now biological waste and yet the people continue to find a way. Even though the river will be contaminated people are still able to dig for freshwater along the banks of the river. The ecological disaster forces the people to change their patterns and yet the Egyptians continue to find the water they need for life to continue. Pharaoh’s heart remains hardened and his will is resolved since his priests can apparently in some way replicate what the LORD is doing through Moses and Aaron. Perhaps, he is also shielded from the immediate effects since he would not dig for his own water, ultimately slaves or servants would do that for him. He retreats to his house without taking to heart the bleeding heart of his empire. He closes his eyes and his doors to the disaster beginning to unfold around him. This entry was posted in Biblical Reflections, Exodus and tagged Apep, Conflict, Exodus, Exodus 7, Lord, Magic, Moses, Nile River, Pharaoh, Ra, Ten Plagues. Bookmark the permalink.